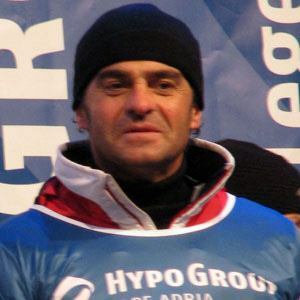 Italian World Cup alpine ski racer who won five Olympic medals, including three golds in the slalom and giant slalom events. He first medaled at the 1987 World Championships of skiing, taking a bronze in the giant slalom. His nickname was Tomba la Bomba. He began skiing with his older brother Marco at a young age. He was born in the Emilia-Romagna region of Italy, the same region that birthed Italian composer Giuseppe Verdi.